With higher capacity and better performance, Tuttnauer's ML Laboratory line of semi-automatic, electro-mechanically controlled, steam sterilizers provides safe, economical and effective sterilization. Integrated reservoir for feed water, with water level control and steam recirculation saves on demineralized water consumption and enables the autoclave to be independent of a water supply. 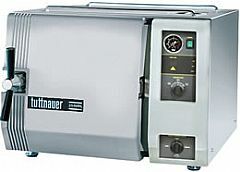 External heating elements make the sterilizer easy to clean. The various applications can be carried out using the autoclave’s standard programs. Pressure-activated door lock prevents the door from opening under pressure. Door lock safety switch prevents the sterilization program from being started if the door has not been closed properly. Overpressure valve releases over pressure in order to prevent high pressure risk.